Happy end of March everybody, and welcome to our monthly roundup. We’ve been all wrapped up in map making this month so it looks like this summer’s going to be full of content releases and we’re really excited about it! Let’s check out what’s in the works right now, as well as a quick community update about our new ambassadors. 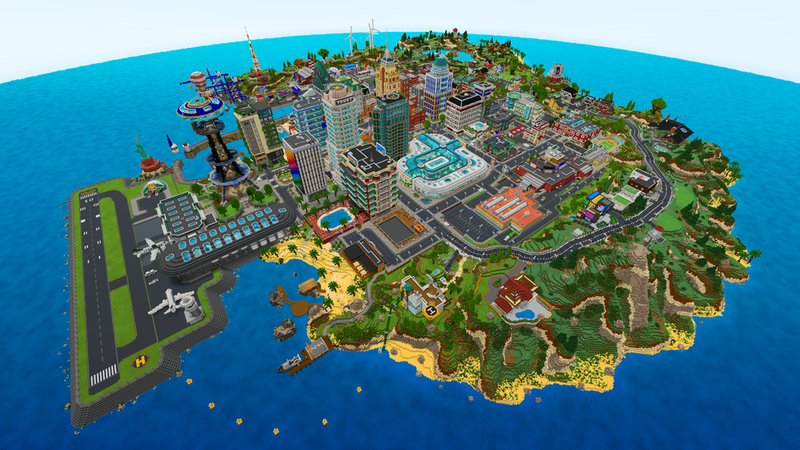 Last week saw the release of our first map of the year: City Living! 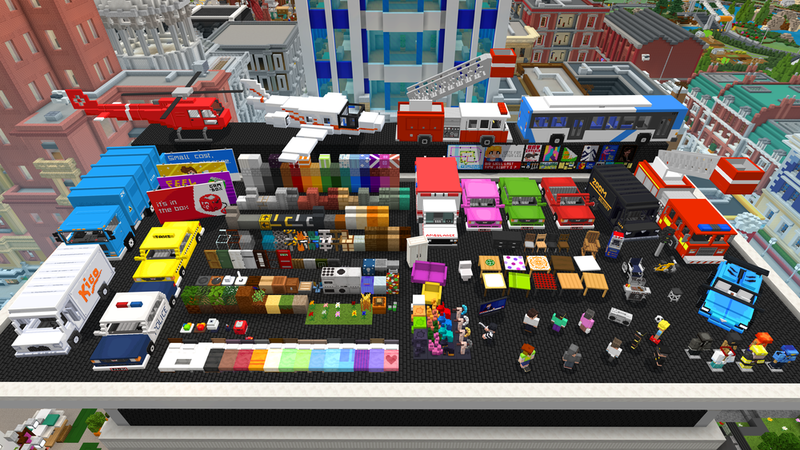 This is the latest map in our Creative Toolbox series and is set inside a big, beautiful city build with dozens of custom entities including planes, helicopters, firetrucks, and a whole host of other vehicles. 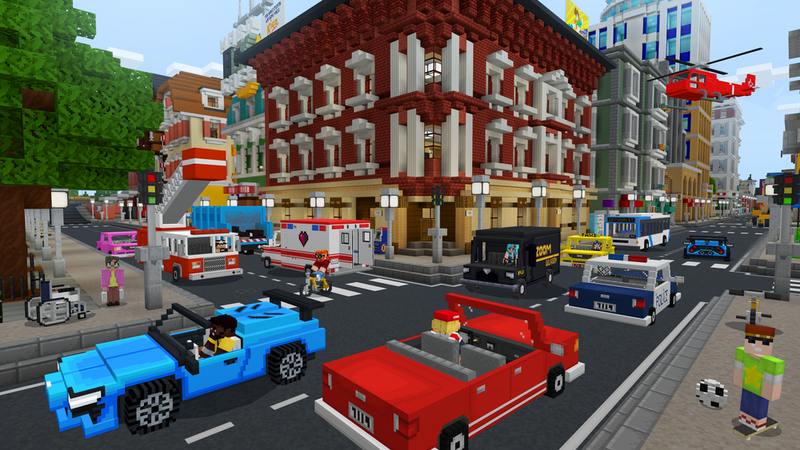 City Living consists of several different districts inspired by cities across the world from London to New York, along with specially designed textures and blocks helping to bring the whole world to life. This is one of the most detailed worlds that we’ve ever released and is perfect for exploring with your friends, ropleplaying, or just sightseeing. What you do is up to you! If you haven’t seen one of our Creative Toolboxes before, I should probably tell you a bit about them. We design these maps with creative players in mind, with the intention of giving players a playground with with room to explore, create and imagine to their heart’s content. The building interiors come mostly furnished, with unfurnished rooms scattered throughout the map for you to decorate to your heart’s content. Our toolboxes come with furniture and decorative items for you to develop your interior designing skills! 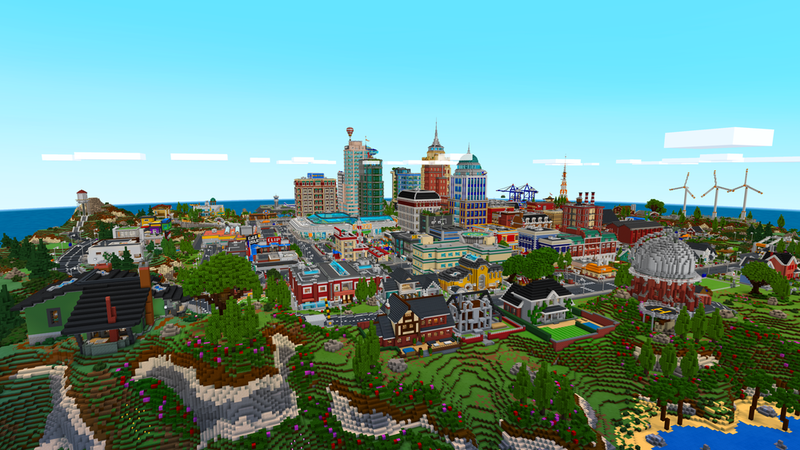 You can view the trailer and read more about the map over on our City Living creations page, or simply head over to the Minecraft Marketplace to pick it up right now on any Bedrock device! To see all of our available maps, skins and more, click the button below. Moving on to brand new projects, the map that the bulk of our team is currently working on will be released as a sequel to one of our original marketplace maps. 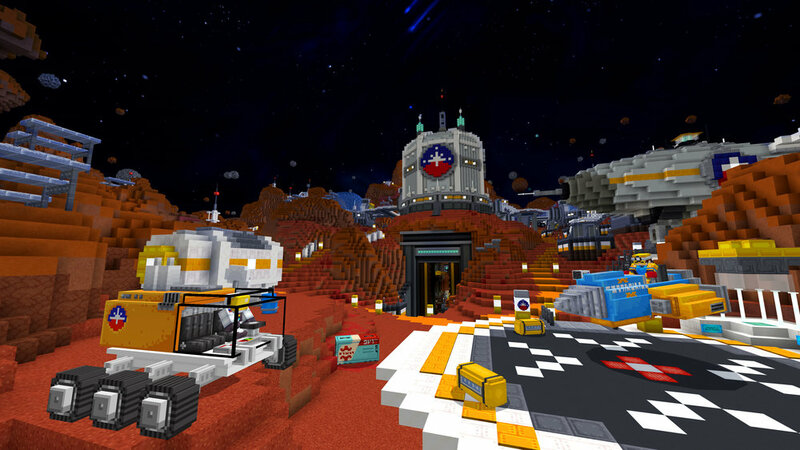 I can’t say much more for now, but take a look back to our first marketplace releases and I’m sure you’ll get a good idea of what’s to come! Leave your guesses in the comments below. In the meantime, the rest of the team is finishing up on our next release which is an adventure map, complete with a full story, boss fights and collectables. It’s a beautiful map to explore and we’ll be dropping some teasers over on Instagram this month so make sure you’re following us there! After closing down our Patreon at the start of the year, we announced that we’d be opening up applications for a new position within our community: ambassadors! Well if you’re a part of the Noxcrew community Discord (hint: if you’re not, join here), you’ll have seen that we have now welcomed a handful of ambassadors to our community. Everyone who has been chosen so far is well known in the community, active on our Discord and we trust to be a happy, friendly face to any new people who stumble across the Noxcrew! Thanks to everyone that has applied so far, and congratulations to our new ambassadors: MissPlaying, Sportycuff, TheNeonGhost, Jammy4312, shaun1e, Ja Jarackus, jeremy-maih, Fluffyrox4, Danny | Bush, Luca, MineDaveXD, RubyJam. That’s all for this month! We’re keeping our heads down and hope to bring you more maps very, very soon.This summer’s going to be a good one.